The day has come for US customers to finally get their hands on the new HTC Evo 4G smartphone today as it goes on sale across America. Available on the Sprint network, the handset sports a super-fast processor, front and back cameras and utilizes the ever-popular Android mobile operating system. Some of you might be wanting to know where to buy the handset, others simply want to know more. Here is all of the information you need in one handy list. The handset will set you back $199.99 and will be locked to a 2-year contract. All retailers are advertising this price except Sprint where customers will have to send off a $100 mail-in rebate. 4G data speeds (WiMAX) – peak download speeds of more than 10 Mbps; peak upload speeds of 1 Mbps; average download speeds of 3-6 Mbps. 3G data speeds (EVDO Rev A.) – peak download speeds of up to 3.1 Mbps; peak upload speeds of 1.8 Mbps; average download speeds of 600 kbps-1.4 Mbps. Can’t Get A HTC Evo? Nexus One – The official Google smartphone is available in the US, UK, Canada, France, Singapore and Hong Kong. Matching the processing power of the Evo, the Nexus One is manufactured by HTC, has the latest Android 2.2 firmware and can be bought unlocked directly from Google. HTC Droid Incredible – The Incredible has been touted by many as the Evo without 4G capability. It is unique enough to stand out on its own, incorporating a FM tuner, 8 megapixel camera, and dual LED flash but still has very similar processing capabilities. Unfortunately the HTC Incredible is also exclusive to US residents with no word of a release date worldwide. HTC Desire – Almost identical to the Nexus One, the Desire is HTC’s own branded Google phone. What sets it apart is the beautiful Sense UI overlay and the fact it’s available worldwide. There are a number of fantastic Android handsets available at the moment, we have listed three HTC alternatives. Honourable mentions include the Samsung Wave, Sony Ericsson Xperia X10 and Motorola Droid. Once you buy the Evo, you will probably want to buy a case for it or add a screen protector. 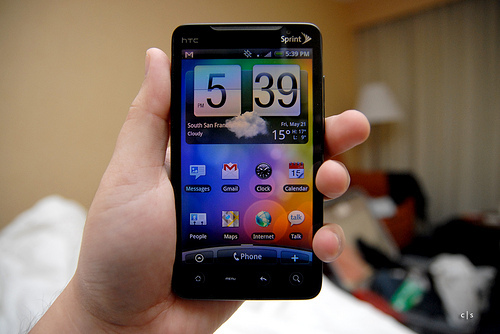 Sprint has a dedicated accessories section for the HTC Evo, available here. We have written up a feature article on Qik Video, an application that takes advantage of the Evo’s front and back cameras to enable two-way video chat (with other Evo owners at this moment in time). To read more click here. If you’ve decided to take the plunge and get yourself a HTC Evo 4G, let us know your thoughts in the comments. Read next: Does your iPad have these weird marks too?